The unbeatable poker playing machine Jump to media player Researchers have created a program that is unbeatable in the game of Texas hold 'em poker. Device helps track elderly health Jump to media player The hub which can help families monitor the health of elderly relatives remotely. Sensor hears gunshots, calls police Jump to media player A US company has developed a system to detect gunshots in buildings and immediately alert law enforcement. Tracker shares your habits with work Jump to media player Fitness tracking company Jawbone has a system that lets businesses monitor the activity data of their employees. 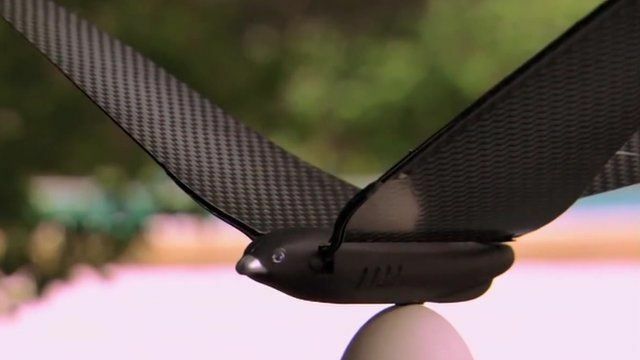 Inventor and engineer Edwin Van Ruymbeke has developed a prototype of a small aerial vehicle in the shape of a bird. The vehicle weighs just over 9g and can be piloted using your smart phone. BBC Click spoke to him in his workshop about the bird and how it differs from other flying vehicles.